The beautiful and remote College Valley runs, almost straight as an arrow, from the tiny hamlet of Hethpool to the very edge of England`s most northerly county. It has been described as one of the most awe-inspiring valleys in Northumberland and history oozes from the hills which roll down from the border. These are quiet hills which reach out towards the 601 metre high summit of the Schil, a hill which proudly greets tired Pennine Way walkers on the final few miles of their arduous journey. 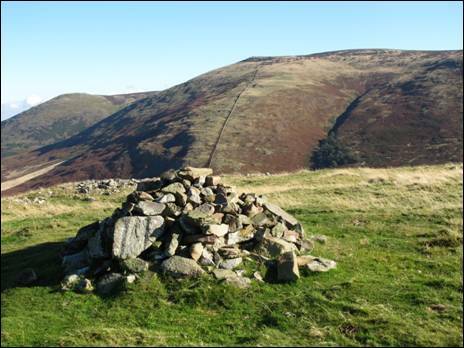 On this walk to and from that majestic summit, you will cross the little visited tops of Loft Hill, Saughieside Hill and Madam Law as well as the slightly more popular Black Hag, White Law, The Curr and Great Hetha. You will be utterly besotted. 1. 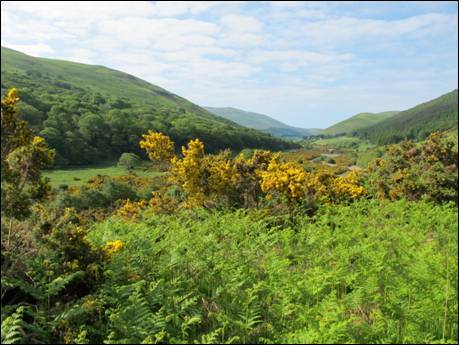 The College Valley lies 7½ miles from the small north Northumberland town of Wooler and is reached along an unclassified single track road heading southwards off the B6351. There is parking just beyond the hamlet of Hethpool, at the end of the public road immediately after the cattle grid (GR NT 893281). Records of Hethpool date from 1242 and when William Weaver Tomlinson wrote his `Comprehensive Guide to Northumberland` in 1888 it was, “…..a lonely hamlet, consisting of a few shepherds` cottages, perched on the high ground above the College Burn”. Since then the exceptionally fine Hethpool House has been built and a row of elegant cottages has replaced the original shepherds` cottages. Both Hethpool House and the cottages are built in the Arts & Crafts style. Time to head into the valley along the narrow tarmac road and within less than 200 metres you will encounter the remains of a Neolithic stone circle. On the grass, to your right, you will see a number of stones lying in a fallen position. After exactly one mile of easy walking, when the road rises alongside a plantation, it is time to bid farewell to the valley. Turn sharp right onto the forest track, signposted `Trowupburn 1 mile Border Ridge 2½ miles`, which climbs around the northern flanks of Sinkside Hill, where (as at summer 2016) there has been much recent tree felling, and very soon you will emerge from the forest boundary (GR NT878266). You will be looking down towards the farmstead of Trowupburn, nestling beside the burn of the same name and surrounded by steep sided hills, where in the early 13th century land was given to the Cistercian monks of Melrose Abbey. 2. Pass through the five bar gate and begin your climb towards the top of Loft Hill, which lies to your left. Keeping the forest boundary within sight, you will need to choose the best route up the steep and pathless hillside. There will be some respite as you reach the saddle between Sinkside Hill and your first hill of the day. Nearby, within the forest boundary, there is evidence of an Iron Age settlement. Continue to follow the fence as it bends to your left and, after approximately 100 metres, turn away to your right to head upwards to the 416 metre top of Loft Hill (GR NT877257). From the small summit cairn there are good views. Now leave Loft Hill in a south westerly direction, heading for the five bar gate and a rough track through the remnants of a hillside plantation. Once over the second gate, continue straight ahead through a recently harvested section of the forest as far as the third five bar gate. At this point be sure not to follow the direction indicated by the Public Footpath arrow but instead continue in a south westerly line up the rough and trackless slope to the 478 metre high summit of Saughieside Hill (GR NT868249). 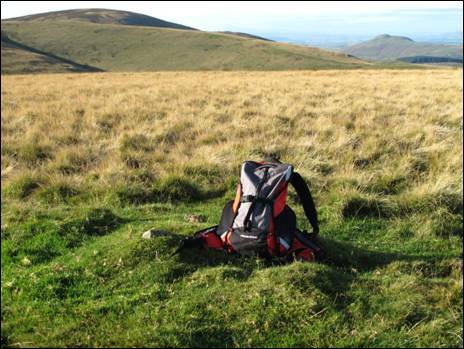 The actual summit is at the southern end of the flat top and from this airy spot there are extensive all round views. 3. You must now head due south and on leaving the hill aim for the visible quad track which climbs the distant slopes towards Black Hag and as you head forwards you will soon join a track which will eventually lead you to these slopes. Once reached, follow the track and the nearby fence as they head in a generally south westerly direction and, after crossing easier, if sometimes wet, ground, you will soon reach the barely noticeable top of Black Hag (GR NT861237). You are now at the border between England and Scotland and you are about to join the route of the Pennine Way. Climb over the border fence, taking care for any barbed wire, and once on Scottish soil turn left downhill. On reaching the depression, cross over the ladder stile, and, back on English territory, turn right and begin the climb up The Schil. 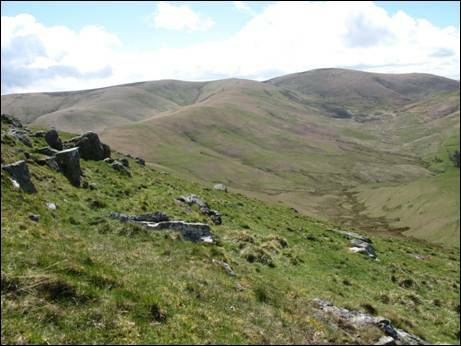 Just 15 feet short of the magical 2000 feet mark, the rocky tor-topped Schil is one of the finest in the Cheviot Hills. It is a place to explore, to scramble about and then to rest awhile, contemplating the walk so far. See if you can find, hidden amongst the rocks which lie to the south east of the summit, the small plaque in memory to, “Steve Bertram who died doing a sport he loved”. 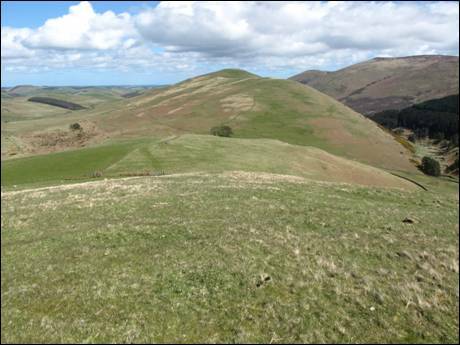 The actual top of this excellent hill lies in Scotland, across the post and wire fence (GR NT869223). 4. You must now retrace your steps for one mile of easy downhill walking as far as the stile over the border fence. 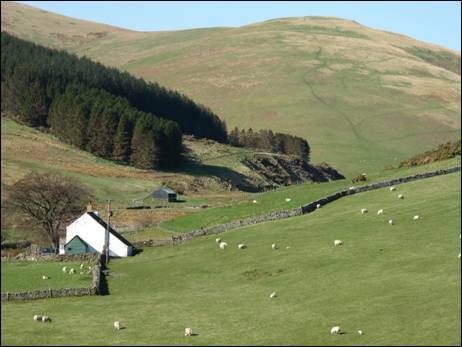 Cross back over into Scotland and follow the track which is signposted `Pennine Way Kirk Yetholm 4½ miles`. Where the track splits into two, just below Black Hag and the obvious Corbie Craig, be sure to follow the left hand spur signposted the Pennine Way low level alternative route. On reaching the five bar gate turn left and, after first dropping downhill slightly, follow the track and the adjacent fence which rise gradually towards the 564 metre top of The Curr, a splendidly bulky Scottish hill. When the track starts to bend away to the left, make sure to head straight on across flatter ground to the summit triangulation point (GR NT850233). From here there are wonderful views in all directions. Retrace your steps back to the five bar gate on the Pennine Way low level route. Ignore the gate and continue straight ahead up the heather covered slope as far as the small gate (GR NT857237) and the Pennine Way high level route. Go through the gate. The next 1½ miles of walking over the grassy surface of Steer Rig is one of the highlights of the day. As you swing along, straddling the valleys of the Halter and Trowup Burns and with superb views it will be difficult not to feel a sense of elation in these high windswept Cheviot Hills. Back down to earth with a bump and it is soon time for the short lung bursting climb to the 430 metre top of White Law. Take time to enjoy the views back over to Black Hag. At this point you must part company with the Pennine Way, which now turns towards its final goal of Kirk Yetholm. 5. Turn right through the small gate (GR NT857261) and, heading north eastwards, drop gently downhill to Wideopen Head. Straight ahead Madam Law lies on the opposite side of a track which arrives from Trowupburn, to your right, and then heads north westwards towards the ancient border crossing of the White Swire. First recorded in 1222, the White Swire was one of seventeen such Cheviot border crossings mentioned in a state paper of 1543 and, standing here, you are sure to feel the cold breath of history on the back of your neck. Cross the track and follow the fence the short steep distance to the top of Madam Law marked by a small cairn (GR NT862267) on the other side of the fence. Just before midnight on the 24th March 1943 a Dornier Do 217E-4 aircraft crashed into this 397 metre high hill following a raid on the docks at Leith, Edinburgh. All four crew were killed on impact. Now turn south eastwards and descend towards the track leading down to Trowupburn, joining it around the 300 metre contour. At this point head north eastwards for half a mile, ignoring any side tracks, over short cropped grass to join the northbound road (GR NT877268) from Trowupburn, just below the south western flank of Great Hetha. 6. Turn right along the road and then cross the step stile on your left to follow the steep permissive footpath which, whilst marked with the occasional marker post, leads you, not always obviously on the ground, to the top of Great Hetha. 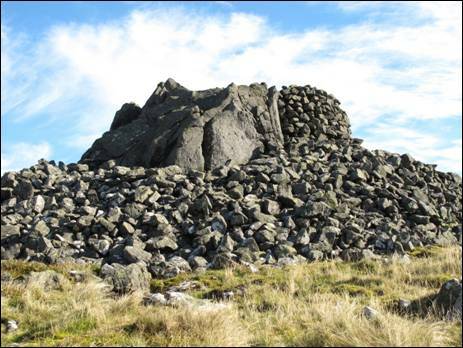 The 343 metre high summit (GR NT885274) stands at the north eastern end of the hill. From here there are panoramic views of the College Valley and the surrounding hills. It is a hill of great historical interest. To the west of the summit there are the remains of a Roman period settlement, consisting of at least eight hut circles laid out along a series of terraces cut into the lower slopes of the hill. On the summit itself, there was a strongly defended Iron Age hillfort surrounded by two ramparts of earth and stone. There is an entrance, on the north-west side, with traces of an in-turned bank where it passes through the inner rampart. There was also an Iron Age hillfort on Little Hetha, less than ½ mile to the north. Leave the summit to the north east, following the `Hillforts Trail` fingerposts towards the small plantation which lies adjacent to the valley road. Keep to the right of the plantation, head downhill on the thin path and, on reaching the road (GR NT890273), turn left. From here, a gentle stroll will soon bring you back to Hethpool and the end of an exhilarating walk in these quiet border hills. Mixed fell, often pathless, with steep ascents & descents, good stretches of green tracks/paths, some boggy ground. Ingram National Park Centre. Telephone: 01665 578890.